He’s different. But, you know, the good kind of different. The kind of different that keeps you guessing, makes you want to know more. The kind of different that looks at challenges not as challenges, but as an opportunity to prove “them” wrong. The different with a personality that demands the room without being demanding. Different that doesn’t beg to be understood, while unapologetically being himself. However, growing up, the discouragement from some of his coaches as well as a naturally shy personality meant he wasn’t always who he knew he could be. Now, King wasn’t always a punter. He began his college career at Fort Valley State, a historically black college in Georgia, as a wide receiver. His transition to punter wasn’t so much a life choice as it was the result of a strong suggestion to focus on punting. A suggestion to kick or his scholarship would be in question. With no technique or any kind of formal training, just a natural ability to send the ball flying, King discovered his kicking talent as a young kid bored in his backyard. He was also the best option for a punter the team had. So King decided not only take on the responsibility, but to make this position his own. Not only did he make a vow, he was able to use punting as a release. What had seemed to be a forced transfer was now King’s therapy. “If we lost a game, I would talk to the campus police officers to leave the lights on at the stadium,” King said. “I’d go to my dorm room, bring my boom box back out, play music and I’d just kick until my leg got so tired that I couldn’t kick a ball no more … that was my therapy. And that therapy led to not only confidence in his game, but the confidence to stop allowing people to lock up the real Marquette King. And because of that, fans across the country are able to reap the benefits of knowing that when King steps on the field, they’re getting a show. 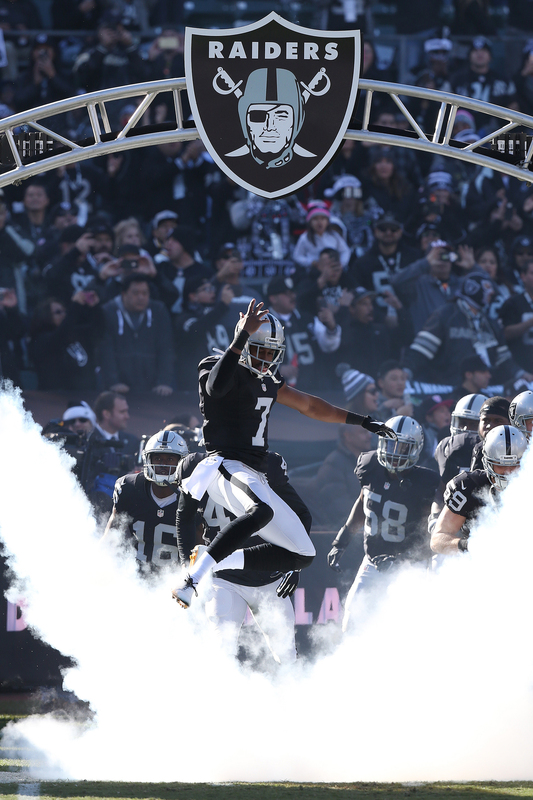 Oakland Raiders punter Marquette King during pregame introductions at an NFL game against the Indianapolis Colts on Dec. 24, 2016, at the Oakland Coliseum in Oakland, California. Stereotype No. 1: They aren’t black. And as the only black punter in the NFL, King’s experience did include jokes, and not just the playful type. Stereotype No. 2: It doesn’t take much to be a punter. Anyone can do it. Stereotype No. 3: A punter is supposed to go out on the field, do what needs to be done, and leave. It’s almost as if it’s a robotic routine. A be seen, not heard sort of thing. “I had a coach that was trying to tell me ‘you don’t need to celebrate,’ like, ‘just punt the ball and walk off.’ I’m like, ‘Walk off?! What you mean, walk off?’ All this effort I put into it I deserve to [celebrate]. “When a DB goes out and backpedals and breaks a pass block and starts doing all that ‘No, he didn’t catch the ball’-type motion … and a receiver catches the ball and gets a first down and goes out there pointing and dancing … I should be able to do the same thing. Who’s going tell me not to?” King said. So shattering these stereotypes is King’s specialty. And fortunately for King, his Raiders special teams coach Brad Seely has been a godsend. “Brad Seely is one of the best special teams coaches I’ve ever had. … He’s like the godfather of special teams,” King said. “It’s a blessing. Man, because … he used to get on my nerves to the point to where I wanted to fight him because he was always talkin’ s—, but that’s what I need. And their cohesiveness shows beyond special teams. So far, King and the Raiders have silenced a lot of doubters this season. Despite “the ultimate MVP” in his eyes, Derek Carr, getting injured, King knows that everyone has to step up and execute his job at the highest level if they want to be true Super Bowl contenders. But just how King lives his life, he takes the path to the Super Bowl one step at a time. And while King takes on his life one day at a time and is determined to enjoy every moment, he wants others to enjoy the same jubilance he experiences every day. 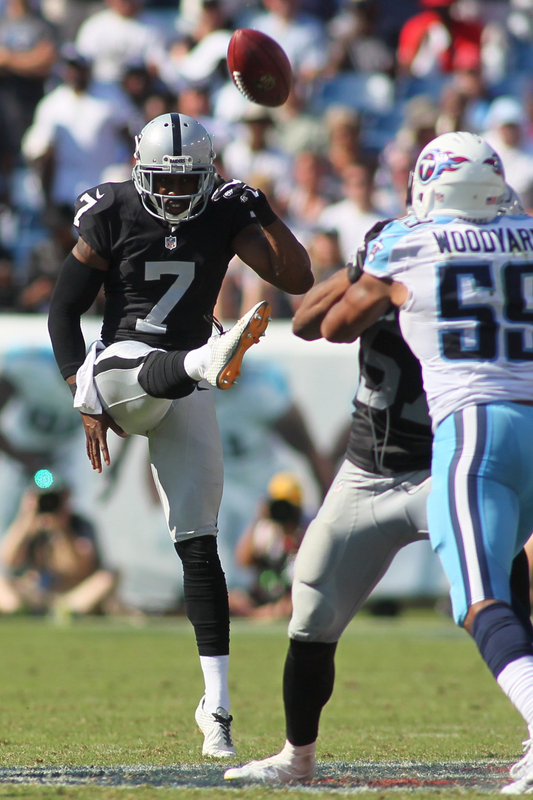 Oakland Raiders punter Marquette King (No. 7) during game action. The Tennessee Titans were defeated by the Oakland Raiders 17-10 at LP Nissan Stadium in Nashville, Tennessee, on Sept. 25, 2106.